Cut-Through Communications is a Melbourne-based consultancy firm specialising in profile building, media training, writing and editing major policy documents, and issues management. Our purpose is to ‘cut-through’ jargon and produce well-written documents, speeches and other materials that help communicate complex ideas and influence outcomes. Cut-Through Communications has a broad range of clients from government, industry and the not-for-profit sector. 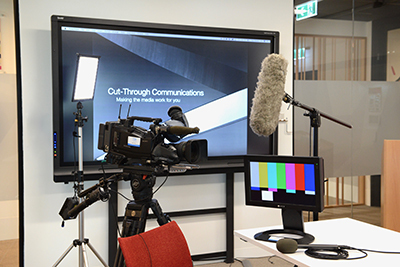 Cut-Through Communications offers customised media training to help ensure that your spokespeople are confident and well prepared for their dealings with the media. Our two principals combine extensive backgrounds in government, journalism and media relations and a working experience across print, television and radio. CTC conducts regular media training for Board chairs, directors, executives, government agencies, medical researchers, climate change and water scientists, social policy researchers and cultural institutions. Our media training is tailored to your organisation’s specific needs and is based on thoroughly-researched, realistic interview scenarios generally practised to camera. We usually recommend a half-day media training session with the focus firmly on interview preparation. We cover the key principles for handling TV interviews and the fundamentals that apply to all successful media engagement. CTC uses the services of experienced camera operators who have worked for all the networks. Together, we rehearse realistic scenarios based on relevant issues. We also run seminars without a TV camera for larger groups. With or without the camera, this important practice brings real time improvement, sharpens performance and helps to build the ability and confidence of your media spokespeople.